Doc Jams Printer Repair, Toner & Supplies offers a retail drop-off location in Madison, WI for printer repairs. Doc Jams also offers a service allowing printers to be shipped in for repair from anywhere in the country. We service all brands of printers including Xerox, Tektronix, HP, Lexmark, Canon, Epson, Brother, Oki, Dell, QMS, Konica, Minolta, Hewlett Packard, Sharp, Xante, and Panasonic. Doc Jams will even repair POS machines, line printers, laser printers, dot matrix printers, inkjet printers and multifunction printers including scanners, copiers and fax machines. We offer convenient repair on printers brought in to our retail location. For easy repair, call us at (608)210-3090 or toll free at 1-888-DOC-JAMS or fill out the form to the right as best as you can. For fastest service simply follow the directions below and drop your machine off at our drop-off location. - Any other items you find necessary. Generally it is not necessary to bring any cords that connect from your computer to your printer. We do ask that you always include your power cord. Click on any of the maps below for help in finding our location. DROP OFF HOURS ARE BETWEEN 8AM AND 4:30PM MONDAY-FRIDAY. When you drop your machine off for repairs, you will be charged an $89.90 diagnostic fee, which also covers the first hour of repair. Our technician will then diagnose and inspect your printer. The technician will call you with a quote on any parts or if additional repair time over the first hour is required. When you pick up your completed machine, you will be charged for any additional hours at the $89.90 rate plus the cost of parts, if any were needed. If your machine did not require parts or additional time, no further payment will be charged. If you live in the Madison area, one of our Doc Jams delivery specialists can pickup your printer for repair as well as drop the machine off to you when the repairs are complete for an additional $50. All charges listed do not include additional sales tax. Doc Jams offers a convienent location on the north side of Madison for drop-off services. This being said, printer technicians are not waiting at these locations. The technicians are scheduled to perform their services AFTER a printer is dropped off. This means that the person you may speak with at the drop off location may not know much about printers. They know only how to accept your printer and get it back to you working better. The in between stuff is all in a Doc Jams Technician's capable hands. Typical repair times are between 3-5 business days. Often these times may be longer due to parts delays or scheduling conflicts. We do appreciate you taking the time to unplug and pack up your printer. We understand this can be a hassle. 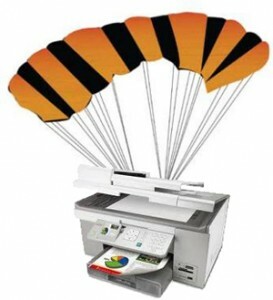 We do need to inform you that Drop-Off machines are secondary to our Onsite printer repairs. If you are in a hurry for your machine, please contact us for onsite repair. Once your machine is completed, we’ll contact you and let you know. Once you have been contacted, we ask that you pick your machine up within a week. If you cannot get to us within a week please let us know. We will hold on to your printer until it is convenient for you to pick it up. If we do not hear from you within a week of our contact and the equipment is not picked up, it will be donated or recycled. Should I get my printer fixed? Only you can answer that question, but we can help. Often we repair machines that are valued less than the repair due to the customer having a lot of extra ink or toner for their machine. Most inks and toners are not interchangeable, making a low cost machine much more valuable when combined with a lot of supplies. Typically if you are not willing to invest at least $90-100 into your machine, it may be time to pursue other options. Hours: 8:00am – 4:30pm Monday -Friday. Only you can answer that question, but we can certainly help. A few things to keep in mind are what you paid for the machine, if you like the machine, how hard will it be to purchase, connect and learn a new machine. If your current printer is not worth more than $100, or a comparable replacement can be purchased for less than $100 it may not make sense for us to repair your machine. However, if you have a lot of ink or toner for your machine that increases the value of your printer to you it may make sense for Doc Jams to repair your machine. Maybe you need to buy a better printer, which Doc Jams can help with. It is possible you will become completely paperless, though we advise against that. Trees grow back, remember.If you need help deciding feel free to call Doc Jams at 608-210-3090. What do I need to bring with my printer when I drop it off? All we ask is that when you drop your printer off to Doc Jams you have enough ink and paper installed to test the printer as needed. We also ask you to bring your power cord. It is not necessary to bring your data connection (USB, parrallel or ethernet) cable. How long will Doc Jams have my printer? Doc Jams technicians look at drop-off printers a few times a week. Typically your printer will be available for pick up 3-5 business days after you have dropped it off. Do I really need to pay you to just look at my machine? Doc Jams technicians spend countless hours training and learning the mechanics and inner workings of printers. To not pay them for their diagnostic wisdom would be similar to thanking your doctor for the diagnosis and not giving them payment, without the thank you. Doc Jams would even argue that we offer better news at a lower price than most doctors do. The diagnostic fee is low and prevents us from collecting machines that may not be worth repairing. This helps keep our overall charges down. In addition, we tried not paying our technicians once. They did not like it. I just want to recycle my printer. Can Doc Jams help? Doc Jams can help with recycling your printer at no cost. Simply drop it off at the Doc Jams office located at 5504 CTY HWY CV Madison, WI 53704. If you would like the printer to be recycled picked up we charge $25.